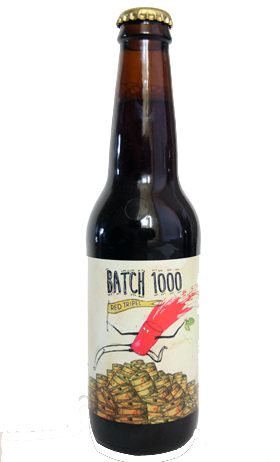 The occasion of Red Hill Brewery's official 10th birthday celebrations was also the moment they chose to unveil their 1000th brew (or Batch 1000 as it's called on the label). It's the second of what will be ten red beers brewed to mark their decade on the Mornington Peninsula, following on from the Bloody Plums saison released earlier in the year. While the saison had merely a hint of red about it, there's no doubting this one's red credentials. Again looking to their beloved Belgium for inspiration, it's a red tripel, somewhat unusual given tripels usually present a pale golden colour. This is a deep, cloudy auburn colour and a beer in which the dark specialty malts (and presumably candi sugar) deliver the most prominent features, with the softer spicy elements playing second fiddle to sweet aromas and flavours of raisins, treacle and rummy booze, before a drying, herbal bitterness kicks in.